Houston’s 3D printing and on-demand manufacturing specialists. Your partner in effective 3D printing solutions. We listen to your project requirements and objectives to deliver the quality you expect. Get a Fast, Accurate Quote. We are Houston’s local 3D printing specialists. We offer an integrated service that helps you complete your project on time, whether it’s prototypes, parts or full productions. Our 3D printing facility in Houston, TX, is leading the way in on-demand manufacturing services. With a strong focus on customer support, we insist on using only the most cost-effective additive manufacturing process that meets your project requirements. 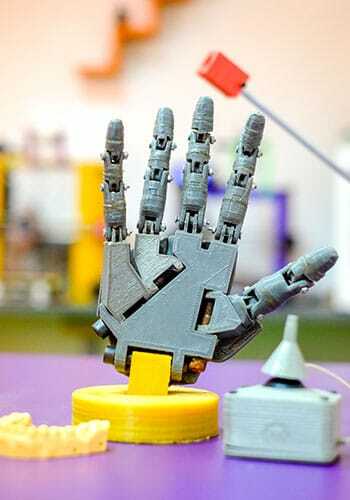 We offer a choice of popular 3D printing technologies known for their efficiency and quality output, along with personal consultation and custom processing options. 3D Printshop in Houston, TX, can deliver your rapid prototypes and low-volume quick-turn parts in less than 48 hours. We specialize in: Rapid prototyping, Advanced prototyping, Low-volume quick-turn injection molding, and Appearance models. Whether it’s creating prototypes, parts or full productions, we offer you an integrated service that fulfills all your project requirements. Our 3D-printed prototype and production service is among the fastest and most reliable in the industry. Get advice and access to rapid prototyping solutions. Your prototype can be ready in as little as 48 hours. When your projects get more complex, you want a team of experts to be on board. Whether it’s manufacturing considerations or materials testing, we provide you with the professional support you need from start to finish. Reduce the production costs of low-volume parts by using quick-turn injection molding. We replicate your design to precision and produce the quantity you need to the highest quality. Enjoy fast turnaround in the process. Create functional prototypes from your digital designs. We offer a wide range of materials, 3D printing solutions, and finishes to complete your model to specifications. We have the expertise to take you through the entire process. We strive to offer the best customer experience in the industry. Our Houston-based 3D printing specialists will provide you with personal support throughout the 3D printing process. Get the help you need by chatting with us online or on the phone. Or simply use our online tool to request a quote today. Need to speak with a local 3D printing specialist? Our Houston-based 3D printing specialists are available Monday – Friday , 8am – 5pm. Get help with all aspects of your 3D printing project. Is your project ready to print? Upload it now to get a fast, accurate quote. At 3D Printshop in Houston, TX, we’ll give you our best pricing and deliver your project in the shortest possible time. Were you looking for printer repair services in Houston, TX? Please visit the Printer Repair Group – Houston, TX for printer repair services. 3D Print Shop and Printer Repair Group are partners of Laser Imaging, Inc.